A contact wound is one in which the muzzle of the weapon is held against the body at the time of discharge. Contact wounds can be hard, loose, angled, or incomplete. In contact wounds gas, soot, metallic particles avulsed from the bullet by the rifling, vaporized metal from the bullet and cartridge case, primer residue, and powder particles are all driven into the wound track along with the bullet. In hard contact wounds, the muzzle of the weapon is held very tightly against the skin, indenting it so that the skin envelopes the muzzle at the time of discharge. All the materials emerging from the muzzle will be driven into the wound, often leaving very little external evidence that one is dealing with a contact wound. 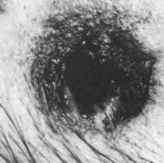 Inspection of the entrance, however, will usually disclose searing and powder blackening (soot) of the immediate edge of the wound (Figure 5.1). Subsequent autopsy will reveal soot and unburnt powder particles in the wound track. 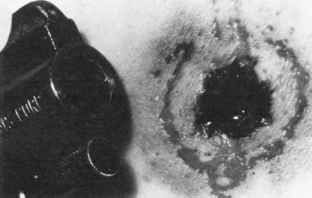 Figure 5.1 Close-up of hard-contact wound of head with a .38 revolver. Hard contact wounds of the head from .22 Short or .32 Smith & Wesson Short cartridges are often difficult to interpret because of the small powder charge loaded into such cartridges. These wounds may appear to be distant because of an inability to detect the small amount of soot produced and to recover unburned powder grains in the wound track. Compounding this problem is the fact that in distant wounds from .22 Short and .32 S & W Short cartridges, drying of the edges can simulate the blackened and seared margins of hard contact wounds. In situations such as this, as well as in cases of decomposition of a body, examination of the wounds with the dissecting microscope for soot and powder grains is of value. 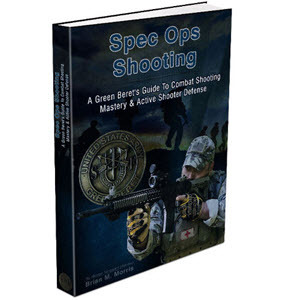 In the author's experience, with use of the dissecting microscope, soot is always present in contact handgun wounds, with powder particles identified in virtually all cases. Unfortunately, recognition of material as soot is to a certain degree subjective. Drying, hemolyzed blood, and decomposition can simulate or mask soot. Generally, blood can be removed by running or spraying hot water over the wound. Clots resistant to the hot water can be dissolved with hydrogen peroxide. Neither hot water nor hydrogen peroxide will remove the soot. In cases in which one is not sure whether a wound is contact and in which no powder particles can be identified by the dissecting microscope, the use of energy dispersive x-ray (EDX) or scanning electron microscope-energy dispersive x-ray (SEM-EDX) should be employed. Using these devices, one can analyze for the vaporized metals from the bullet, cartridge case, and primer. in the left chest with a .357 Magnum revolver. A perfect imprint of the muzzle was seen on the chest, thus indicating the contact nature of the wound. Examination of the exit in the back, however, revealed grains of ball powder in the exit wound and a cherry-red color in the adjacent muscle caused by carbon monoxide. The presence of carbon monoxide was confirmed analytically. To further confuse the interpretation of the wounds, the exit was shored. Thus, the exit in this case was characterized by an abraded margin, powder grains, and carbon monoxide. The author has seen a number of cases in which ball powder traveled through the body and was found at the exit. All cases involved contact wounds, with the entrances in both head and trunk. The weapons involved were of .22 Magnum, .38 Special, 9-mm Luger, .357 Magnum and .44 Magnum caliber. In one case, an individual had his hand in front of his face and in hard contact with the muzzle of a .357 Magnum when it discharged. Ball powder traveled through the hand tattooing his face. Though carbon monoxide and powder may travel through a body and be found at the exit, the author has never personally seen soot do so. Contact wounds in regions of the body where only a thin layer of skin and subcutaneous tissue overlies bone usually have a stellate or cruciform appearance that is totally unlike the round or oval perforating wounds seen in other areas (Figure 5.3A). The most common area in which stellate wounds occur is the head. The unusual appearance of contact wounds over bone is due to the effects of the gas of discharge. When a weapon is fired, the gases produced by the combustion of the propellant emerge from the barrel in a highly compressed state. In hard contact wounds, they follow the bullet through the skin into the subcutaneous tissue where they immediately begin to expand. Where a thin layer of skin overlies bone, as in the head, these gases expand between the skin and the outer table of the skull, lifting up and ballooning out the skin (Figure 5.4). If the stretching exceeds the elasticity of the skin, it will tear. These tears radiate from the entrance, producing a stellate or cruciform appearing wound of entrance. Re-approximation of the torn edges of the wound will reveal the seared, blackened margins of the original entrance site. In some contact wounds over bone, instead of the classical stellate or cruciform wound, one finds a very large circular wound with ragged, blackened, and seared margins. 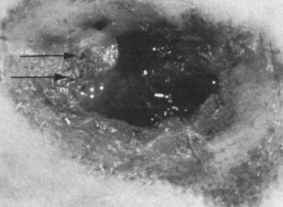 This type of wound is more common with the less powerful calibers such as the .32 ACP or .380 ACP (see Figure 5.3B). 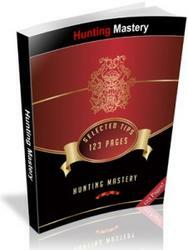 On occasion, however, it is seen with even the larger more powerful cartridges such as the .38 Special and .45 ACP. Figure 5.3 Contact wounds of head. (A) Stellate wound of temple from .38 Special revolver; (B) circular wound of entrance from .380 ACP. Figure 5.4 Contact wound of head showing dissection of gas between scalp and skull. The presence of tearing of the skin as well as its extent depends on the caliber of the weapon, the amount of gas produced by the combustion of the propellant, the firmness with which the gun is held against the body, and the elasticity of the skin. 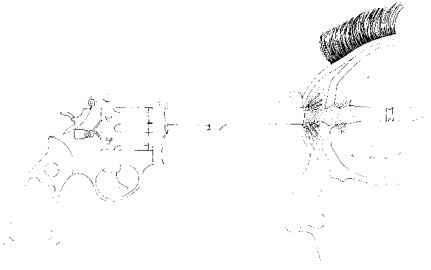 Thus, contact wounds of the head with a .22 Short usually produce no tearing, whereas those due to a .357 Magnum usually do. It must be stressed, however, that exceptions occur. Irregular, cruciform, or stellate entrance wounds can occur in individuals shot at intermediate or distant range, where gas plays no role in the production of a wound. These occur when the bullet perforates the skin over a bony prominence or curved area of bone covered by a thin layer of tightly stretched skin (Figure 5.5). The head is the most common site for such wounds. The forehead as it slopes back at the hairline; the top and back of the head; the supraorbital ridges and the cheek bone are common sites (Figures 4.22; 5.5A). An uncommon site is the elbow (Figure 5.5B). If the bullet is deformed or tumbles prior to striking the body, the tendency to produce cruciform or stellate wounds is further accentuated. A tangential gunshot wound of the face may simulate a stellate contact wound (Figure 5.6). 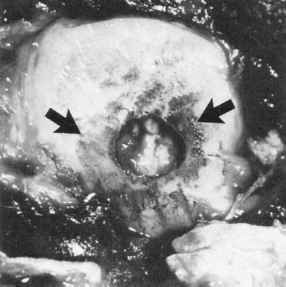 In contact wounds of the head, if the skin and soft tissue are retracted, soot will usually be found deposited on the outer table of the skull at the entrance hole (Figure 5.7). Soot may also be present on the inner table and even on the dura. Soot is usually not seen on bone when the wound is inflicted by either a .22 Short or a .32 Smith & Wesson Short cartridge. 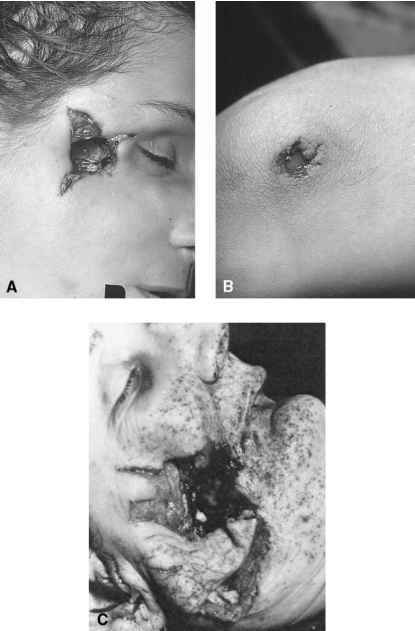 Figure 5.5 Distant range wounds of: (A) right side of face (from .357 Magnum revolver) and (B) elbow; (C) intermediate-range gunshot wound from .357 Magnum — range approximately 1 ft. Figure 5.6 Tangential gunshot wound of left cheek from 9-mm bullet. Figure 5.7 Powder soot deposited on outer table of skull around entrance site. 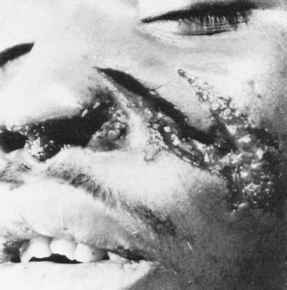 Figure 5.8 Contact wound with muzzle imprint. Rarely, in contact wounds of the head from weapons of .38 Special caliber and greater that fire cartridges loaded with true (spherical) ball powder, the large irregular or stellate wounds produced may initially appear to show neither soot nor powder. Careful examination with a dissecting microscope will reveal small clusters of ball powder. It must be kept in mind, that the presence of only one or two grains of powder does not necessarily indicate a close range wound. The author has seen a number of distant entrance wounds in which one or two grains of powder have been carried to and deposited in the entrance wound by a bullet. In contact wounds of the trunk, stellate or cruciform entrances in the skin usually do not occur, even when the weapon and ammunition used produce large volumes of gas, because the gas is able to expand into the abdominal cavity, chest cavity, or soft tissue. Rarely, contact wounds of the chest overlying the sternum, inflicted by handguns firing high-velocity pistol ammunition, may produce extremely large circular wounds of entrance with ragged margins. In contact gunshot wounds in areas where only a thin layer of skin overlies bone (usually the head), the gas expanding in the subcutaneous tissue may produce effects other than tearing of the skin. The ballooned-out skin may slam against the muzzle of the weapon with enough force to imprint the outline of the muzzle on the skin (Figure 5.8). Such imprints may be extremely detailed. The more gas produced by the ammunition and weapon, the harder the skin will impact against the muzzle, and thus the greater the detail of the imprint. Figure 5.9 Muzzle imprint on chest from .38 Special Colt revolver. The diameter of the imprint is 24 mm, not quite double the actual diameter of the muzzle of the gun which was 13 mm. abdominal wall will bulge out. These imprints are often larger, sometimes twice, the actual dimensions of the muzzle of the gun. Thus, in Figure 5.9, the muzzle imprint measures 24 mm in diameter while the muzzle diameter was actually 13 mm. 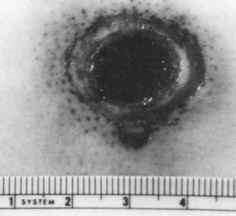 Figure 5.10 Hard-contact wound of chest from 9-mm automatic. Abraded skin around entrance. How close is a gun shot to leave soot? What is a contact wound to the head? Is soot present with contact wounds? What is a stellate appearing wound? Can a stellate wound be caused even by an accidental shooting? How is a gun contact wound discovered? How big is the exit wound from a 357 Magnum? What is a contact wound to the back of the head? What is angle contact wound from a gun? What is a loose contact wound? What weapon did Ben used to wound madec ch 1417?